This film is a remake of "College Scandal" (1935). The stars of that movie were Arline Judge, Kent Taylor, Wendy Barrie, Benny Baker and William Frawley. The director was Elliott Nugent, and the screenplay was credited to Frank Partos, Charles Brackett (of later Charles Brackett and Billy Wilder fame) and Marguerite Roberts. 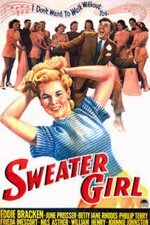 However, this remake certainly boasts a much more interesting cast and it's directed with a surprising amount of polish (at least by the standards of the typical major studio "B" brigade) by William Clemens, who is is usually (and justly) regarded as a work horse with no particular talent than the ability to keep a movie within in its narrow budget. The stylish photography here by John Mescall is also well above the demands of "B"- grade competence. Until the rise of Elvis Presley, the movie was also highly regarded for presenting the song, "I Don't Want To Walk Without You", introduced in the film by the popular radio crooner, Johnny Johnston. That song was a huge wartime hit.